Delivering a better customer experience is always a key goal, but not always that easy to achieve. Effectively implementing and utilising a Voice of the Customer program is the answer. By now, most enterprises understand that customer experience is vital to their businesses. In fact, many might go so far as to point out that in the current economy, they expect to be competing primarily on the customer experience ticket. Given this, it is no surprise to learn that most companies think they know what their customers want. Unfortunately, what they think and what their customers think often diverge quite drastically. And failure to properly understand what your customer wants inevitably leads to a slump in respect of everything from product research and development to marketing communications, and from sales effectiveness to services delivery. This means that companies need to understand their customers better if they truly plan on delivering the kind of customer experience that will differentiate them from their competitors. 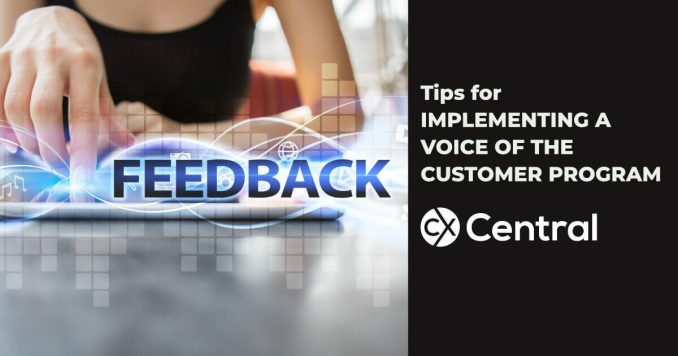 It is here that the voice-of-the-customer (VoC) program comes into play, as this is something uniquely designed to help companies better understand the experiences they are delivering. VoC describes customers feedback about their experiences with your products or services, as well as their future expectations for these solutions. Remember that in the end, the customer experience lives entirely in the minds of the customer themselves, regardless of what your organisation might think. This is why VoC programs are such a priority for so many businesses – the ability to truly listen to the customer and get inside their head is crucial if your goal is to compete on customer experience and VoC programs are the only way to systematically listen and then use this data to take action to improve the customer experience. VoC programs also enable you to monitor your own performance over time. Of course, implementing an effective VoC program is no simple task. It entails capturing, categorising and prioritising customer expectations and preferences. This is necessary in order to ensure that the right mix of culture, people, processes, and technology are put in place, in a sustained effort to unfailingly delight the customer. Of course, it is also important to understand that customers are never a single, homogeneous group. Therefore, in order to be effective, a VoC program will need to be based on well-defined customer segmentation. This can be done according to specific demographics, and by transactions, behaviours or other activities. It should also take into account other influences like loyalty program attributes and, of course, social media behaviours. A good VoC program should encompass both manual and technology approaches: manual methods can include focus groups, reference programs, and customer interviews, all of which deliver good qualitative analysis, but fail to scale well. To achieve real scale, you should leverage technology, as this will also enable your business to continuously gather customer feedback in a way that makes it much easier both to analyse and to act upon. Obviously, the more customer data you have access to, the more effectively you will be able to understand the VoC. This means bringing together the customer data stored in everything from your ERP and CRM to that found in e-mail, service management, billing, and marketing records. In other words, effective VoC requires you to find a way to bridge the disparate data silos within your organisation, in order to properly consolidate and make sense of customer relationships. If approached properly, there should also be little difficulty in obtaining the relevant feedback required from your customers themselves  , after all, customers like to be heard and will thus most likely be happy to engage in a VoC program. Of course, this happiness will not last if the customers get the impression that you are failing to act on their input. In fact, this will likely have the opposite effect to the one you want, as it will leave them with a distinctly bad impression of your service. It should be noted that a Gartner study has found that although some 95% of companies claim to collect customer feedback, not even half of these even bother to alert staff to the results thereof, let alone actually letting their customers know how this feedback is used. For a VoC program to be successful, you clearly need to close the loop and inform participants what was done, based on their feedback. One of the worst things you can do is to ask for input and then ignore it. It is equally crucial to understand that VoC should be treated the same as any other touchpoint in the customer journey. In other words, your customer feedback mechanism should be designed to be a part of the customer journey. This means that when it comes to capturing and actioning customer feedback, this must be done in a way that is authentic. Therefore, you must make the experience of giving feedback a journey in its own right. This is what we mean when we say that you must not only ask customers if they want to participate but must also close the loop by apprising them of exactly what you have done with their feedback. Also, a successful VoC program is one where you ensure that feedback is obtained in a manner that is relevant to the customer. For example, asking them to fill in a short survey the moment they access your website is not relevant, as the customer has not yet done anything. Neither is asking them questions based on a standard template, as there will inevitably be queries here that are related to touchpoints that they have not even interacted with  not only is this not relevant, but it demonstrates to the customer that you are not genuinely interested in specific information, as you are utilising a generic template. Another golden rule for a successful VoC approach is to ensure that the customer is asked to undertake the survey or questionnaire as soon as possible after the event you are asking about. Remember that memory can fade quite quickly, so asking the customer how they felt about an experience that happened weeks ago will certainly impact on the accuracy of the response. Most importantly, if enterprises want customers to tell them how they feel about all aspects of their interactions with the company, it is vital to make this experience as easy as possible to complete. At the same time, you cannot make things too easy, for fear of, on the one hand, being seen as generic, and on the other, of not receiving data that can effectively be actioned. In other words, you need to find the middle ground where you can obtain feedback that is both easy to supply by the customer and actionable by your company. The bottom line is that if you want to be a customer experience leader, then listening to the needs of your customers is no longer an optional exercise. It is now vital to understand customer and market perceptions and how customer interactions with your organisation are actually being experienced by them. If you dont understand this, it will be extremely difficult even to meet, much less exceed, your customers expectations. Moreover, the value of listening to customers is real, measurable, and immediate and will undoubtedly assist you in improving your organisation’s performance. Get help implementing a Voice of the Customer program – we’ve got solution providers from consultants, VoC technology suppliers and more in our Business Directory.